Toshiba recently introduced its new generation of enterprise-class nearline HDDs for servers, surveillance, and higher-end NAS systems. The new MG05ACA-series hard drives offer up to 8 TB of capacity and 12% higher performance than their direct predecessors, but one of their key selling points is Toshiba’s NAND flash-based cache technology for data protection in case of power-loss events that was originally designed for mission-critical HDDs. Toshiba’s MG05ACA-series HDDs are currently available only in 8 TB configurations and are based on multiple PMR (perpendicular magnetic recording) platters with either 4Kn or 512e sectors. The hard drives use a SATA 6 Gbps interface, feature a 7200 RPM spindle speed, a 128 MB cache buffer, and Toshiba’s persistent write cache (PWC) with power loss protection (PLP) that stores data that is not yet written to the HDD media. When it comes to performance, Toshiba declares up to 230 MB/s sustained host to media transfer speed as well as 4.17 ms average latency. As for power consumption, the MG05ACA-series hard drives are rated to consume up to 11.4 W during random reads and 6.2 W in active idle mode. The Toshiba MG05-series HDDs are designed for nearline applications (i.e. somewhere between rapid access and cold storage) that operate for 24/7. The model is rated for 550 TB/year annual workload (read and write) as well as for 2 million hours MTBF. 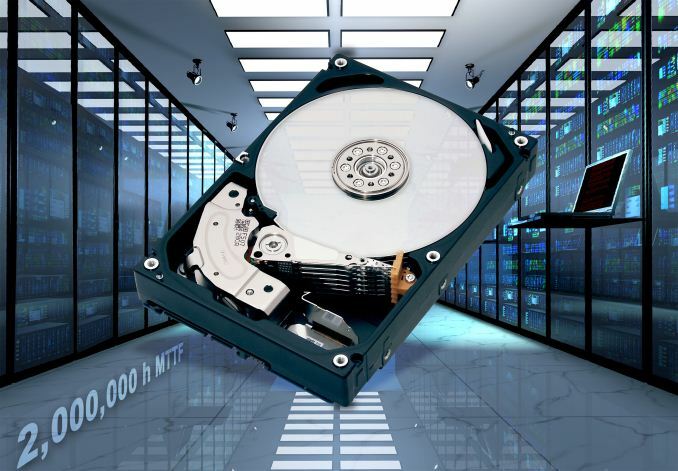 Typ enterprise-class hard drives are based on special platforms with improved endurance prone to operate under high vibration conditions (i.e., in rack servers) due to rotational vibration compensation technology as well as special spindle mounting mechanism. The performance of the drives (and their positioning) indicates that we are dealing with PMR-based products, but Toshiba remains tight-lipped regarding the exact number and capacity (areal density) of the platters it uses. 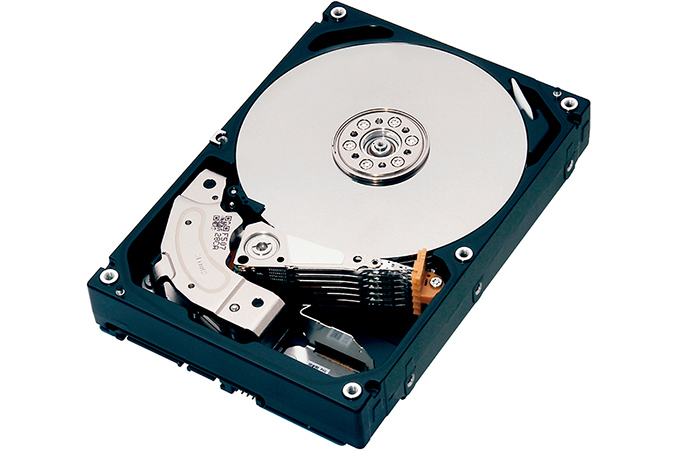 The only photo of the MG05ACA HDD that Toshiba has published depicts a hard drive with seven arms and six platters, but press images are not always accurate. Meanwhile, power consumption of the HDDs (well over 10 W) indicates that we see a typical air-filled HDD. Apparently, Toshiba plans to first use SMR (shingled magnetic recording) and helium for read-oriented drives designed for cold archives and only then use the latter helium drives for its enterprise-capacity HDDs. At this point not using helium puts Toshiba in a tough position as it has nothing to compete against 10 TB and 12 TB drives from its rivals. It is noteworthy that Toshiba’s MG05-series HDDs are the company’s second-gen 3.5” nearline hard drives to feature its persistent write cache with power loss protection technology. The manufacturer does not disclose capacity of the NAND flash-based cache, but it does not have to be too high. There are several situations when the PWC with PLP comes into play, with the main one being when the HDD write cache contains data not yet written to media and a power loss occurs, the data is moved to non-volatile memory. Toshiba's MG05ACA800A and MG05ACA800E are available to the company's customers now. We expect the MG05 lineup will over time be expanded with models featuring lower capacity as well as with versions that use the SAS 12 Gb/s interface. All the Toshiba MG-series drives are covered by the company’s five-year warranty.